Just found someone selling VME ISA adapters for graphics cards. What I've noticed is with this sort of setup there seems to be 3 choices for card, either an ET4000, or ATI Mach32 or Mach64. I can get either the ET4000 or the Mach32 easily enough. But which one works better? 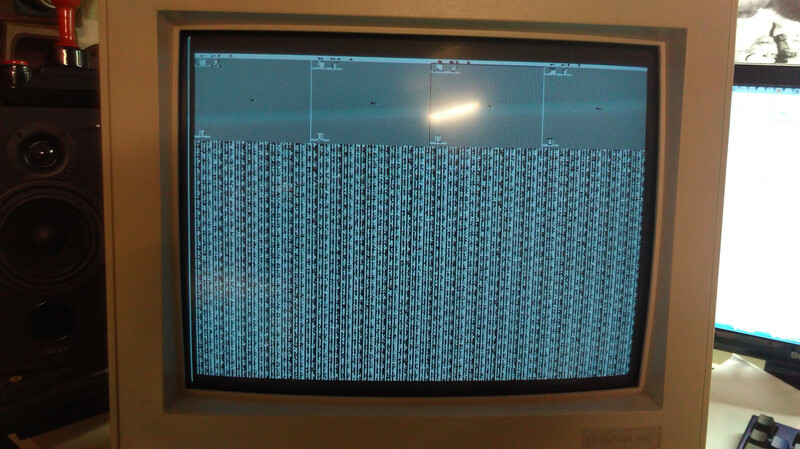 ATI MACH64 do not work on a Mega STE, at the moment is it Atari TT only. Isn't the new graphic modes what is interesting in case of this graphics cards for Ataris ? ET4000 should know true true color (16M), if I'm not wrong. What will be for sure slow, but looks nice. This is with your Nova board, Mach32, and the drivers you say to use in the paper you put with it. No hard drive installed, only those files in floppy drive auto folder. I would show it through ebay but their msg system does not do pictures. I think, okay, must be the problem. Go look for it in other NOVA driver zips on that site you told me to get it from. Stumble though google translate, first menu option tells me "no resolutions" exit MENU.PRG, get same trash screen as image above. Why do people think its acceptable to sell stuff without any documentation... I have no idea what to do to maker this stupid thing work. Nobody has put the answer online. Why is it being kept secret? Send me your email address and I give your the driver for the MACH32 with Infos. Tell me whether you have a TT or MSTE and your MACH32 have 1 or 2MB Ram. Note that the little ATI MACH32 with 1MB and a 85Mhz Bt RamDAC can only work with 2 or 256 Colors. 15 or 16bit Color do not work. The card work only maximal to 1024x768 Pixel. When you upgrade the card to 2MB DRAM the Driver will see the card only as 1MB card, so 2MB do not work. Idek will may be work on it to fix the faults with the Bt RamDAC Card !? !